Welcome to the Crowne Plaza St. Louis Downtown Hotel and Suites. Located in the heart of downtown St. Louis, adjacent to the majestic Gateway Arch, the newly-renovated Crowne Plaza St. Louis-Downtown offers the kind of warm hospitality, inviting atmosphere, and top notch services sure to please business and leisure travelers alike. Exciting attractions which are within minutes of the Crowne Plaza St. Louis-Downtown include Busch Stadium home of the St. Louis Cardinals, Edward Jones Dome, America&regs Center Convention Center and the World-Famous Anheuser-Busch Brewery. Nearby entertainment districts include Laclede&regs Landing, Washington Avenue Loft District and Soulard neighborhood. We are also conveniently located near many Fortune 500 companies such as Accenture, Bank of America, Deloitte, Kraft, Anheuser Busch, Wachovia, Nestle, AT&T, IBM, and Peabody Energy to name a few. The Crowne Plaza St. Louis Downtown just completed a $6 million dollar renovation. Experience a night like no other in our brand new 'Sleep Advantage' seven layer bed amenity package and utilize our complimentary high-speed Internet in all guestrooms. 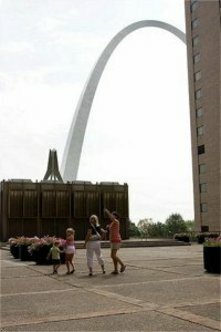 Stay at the Crowne Plaza St. Louis Downtown and enjoy our breathtaking views of the arch, 24 hour fitness club, business center, sundries shop, and renovated guestrooms. This hotel is committed to providing accessible facilities under the American Disabilities Act. If your accessibility needs are not met, please contact the Hotel Manager on Duty. Should you require additional information regarding accessible facilities for guests with disabilities, please call 1-800-Holiday (U.S. and Canada) or contact the hotel directly. For the hearing impaired, TDD service is available at 1-800-238-5544 within the U.S. and Canada.